President Donald J. Trump finished his address moments ago, offering the Democratic Party a compromised illegal immigration solution that would bring an end to the government shut down, institute extended protection for DACA recipients and other illegal aliens, as well as provide initial funding for 230 miles of steel barriers along the southern border. 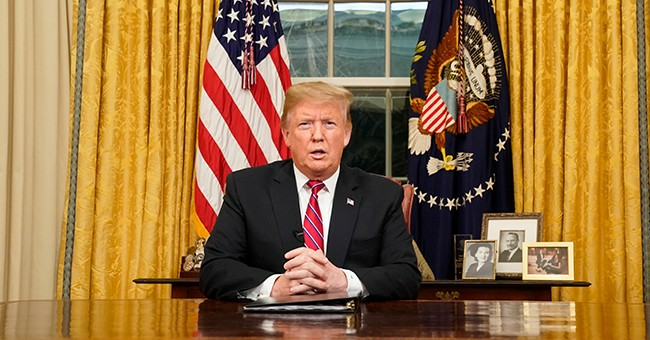 "If we are successful in this effort, we will have the best chance in a long time at bipartisan immigration reform, and it won’t stop here, it will keep going until we do it all,” the president told the nation. "Our immigration system should be a source of pride, not a source of shame," the commander-in-chief added. As noted by Fox News, "It would also offer $800 million for drug detection technology to secure ports of entry, 2,750 new border agents and law enforcement professionals, and 75 new immigration judges to reduce the backlog of asylum requests. He said that all his measures have been supported by Democrats before." But, even before the president made his remarks, Democratic leaders hinted they would reject this plan. "Similar inadequate offers from the Administration were already rejected by Democrats. The BRIDGE Act does not fully protect Dreamers and is not a permanent solution," a senior House Democratic aide told The Hill. "This is not a compromise as it includes the same wasteful, ineffective $5.7 billion wall demand that shut down the government in the first place," the source added. After the announcement, key supporters Ann Coulter and Michelle Malkin blasted the president for what amounts in their eyes to "amnesty." It is theorized that President Trump simply offered this proposal knowing the Democrats would never agree to it as a strategic political move to place the blame on Democrats for refusing to compromise, but other pundits observed it may not be as beneficial for the president as he thinks. The positive is this shows independents that Trump is open to compromise, might make his poll numbers go up. Axios' Jonathan Swan reported President Donald J. Trump could announce today a supposed illegal immigration deal that will seek protections for Deferred Action for Childhood Arrival recipients for the next three years as well as an extension of legal status for Temporary Protected Status holders in exchange for $5.7 billion border wall funding along the Mexican border. Observers should remember that in 1986 Republican President Ronald Reagan offered a massive amnesty compromise with Democrats to increase border security and decrease illegal immigration which resulted in neither a secure border nor a deterrent for illegal aliens. In fact, it arguably had the opposite outcome. If Swan's reporting is correct, this plan could pave the way for similar disastrous policy. According to Axios, Jared Kushner and Vice President Mike Pence have orchestrated this deal after South Carolina Senator Lindsey Graham suggested it in December. But, Senate Majority Leader Mitch McConnell noted that "the letter from Nancy Pelosi telling Trump not to deliver the State of the Union" was a turning point for negotiation strategy. Axios' source says that "McConnell had been saying all along that Pelosi and Trump needed to negotiate because one needed to put a bill on the House floor and one needed to sign it — two people with singular power." Likewise, Axios says that "advocates for the plan argue that by offering the new proposal, Trump is showing he’s willing to negotiate while Pelosi remains unmoved. But even some top Republicans are skeptical Trump's overture will be enough to break the logjam." This could purely be a political move, with the president never expecting Democratic leaders to actually agree to it. This proposal could give the President a chance to make a play on voters who oppose the wall but want some sort of compromise by showing it is the Democratic leaders who are not willing to work together. But, the question remains if this legislative deal would still be enough to stop illegal immigration the way the president intends to or if it would simply encourage more of it. In 1986, President Ronald Reagan signed a historic immigration bill that granted "legal status, or amnesty, to aliens who can show that they entered the United States before Jan. 1, 1982, and have resided here continuously ''in an unlawful status'' since then. Aliens, such as foreign students or tourists, would generally be ineligible for the amnesty if they were in the United States legally for any portion of the time after Jan. 1, 1982." The bill was supposed to curb illegal immigration by increasing border patrol security and punishing companies that hired illegal aliens. Likewise, aliens granted amnesty were "ineligible for welfare, food stamps and most other Federal benefits" with some "exceptions for the aged, blind and disabled and for pregnant women." Likewise, "the Federal Government..set aside $1 billion a year to reimburse state governments for the costs of providing public assistance, health care and education to illegal aliens who gain legal status." But, not long after this law went into effect, The New York Times noted that "The mass of newly legalized immigrants is also acting as a magnet for illegal aliens who want to come to the United States to join friends and relatives." Likewise, Democratic and Republican officials' "plan to strengthen the Border Patrol was never fully carried out, and experts reach widely differing verdicts on the effectiveness of the sanctions against employers who hire illegal aliens." Fast forward 30 years later, and the United States is still dealing with an illegal immigration problem at our porous border. Every previous president has declared that this is a problem, but have failed to actually solve it. This potential plan likely would not solve it either and will only create more headaches. The first problem, as noted by Adam Shaw, is that it is unclear if President Trump's plan would even cover the expense of the wall and what else President Trump would have to give up to earn more funding. But even if the wall was fully funded, this plan would still create problem for Conservatives as illegal aliens who otherwise do not qualify for DACA would likely turn to immigration legal advocates to sue to claim they too deserve the same protections. The amount of time alone for thousands of illegal aliens in courts could take years. Plus, this codifying of protection for three years would eventually pave the way for permanent citizenship for these workers, especially if a Democratic president takes office in 2020. But, in the short term, the threat of a wall and confusing policy would likely increase the flow of illegal immigration as well. This has its place in history after a Government Accountability Office report declared in 2015 that President Barack Obama's immigration policy and intended deterrents actually increased the number of illegal aliens entering America after wrongly assuming they could be eligible for DACA if they crossed the border. At the time of the passing of the 1986 bill, President Ronald Reagan declared that 'Future generations of Americans will be thankful for our efforts to humanely regain control of our borders and thereby preserve the value of one of the most sacred possessions of our people, American citizenship." That obviously did not come into fruition as that effort did not allow America to retain control of its borders. It seems then-Rep. Chuck Schumer was more on the money when he said that, "The bill is a gamble, a riverboat gamble. There is no guarantee that employer sanctions will work or that amnesty will work. We are headed into uncharted waters.'" Today, President Trump's potential immigration deal is also a "riverboat gamble" both politically and legislatively speaking. The compromise may gain some voters for the Republican party but if actually passed would more likely guarantee an influx of illegal immigration and full amnesty down the road when a Democratic president assumes office. This post has been changed from its original headline of "President Trump's Potential Border Wall Deal Sounds Like Disastrous 1986 Immigration Compromise" to help avoid confusion.